The M.A.C Viva Glam Fashion Cares 2001 “Garden” event has exceeded expectations, as it does every year. 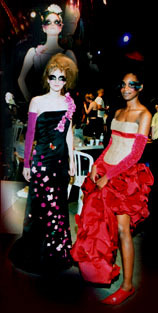 Fashion Cares is the most beloved fashion event in Canada, as far as the media is concerned. It’s virtually impossible to cover all the angles and to capture all the excitement - you have to be there to truly experience it. It’s one of the rare moments in Canada when anything goes, providing it’s original and shocking enough. Toronto and Vancouver have both staged their version of the “Garden” theme (a friendly competition for originality) and M.A.C Viva Glam is now on its World Tour. Sarah Reeder, Western Editor for Vancouver FASHION magazine shares with us her thoughts on the Vancouver event. She feels that it was as exciting as Toronto’s, but being put together by a different team of volunteers rendered it distinct. We all hope that this excitement will translate into increased support for the cause in the months to come, as it did during the event. The thing that excited us the most about Fashion Cares is the creative and volunteer spirits that bring the ultimate climax to the event every year. In the spirit of giving and making something good happen, the creative volunteers, under the artistic direction of Phillip Ing, imbued the night with images of indescribable beauty and passion. We need to harness this energy and apply it to make a difference in our community, as well as in our lives. “Canadians are aware that HIV/AIDS exists, but many of us have become naive or apathetic to the serious and deadly repercussions it hold,” says Lee Zaslofsky, spokesperson for the AIDS Committee of Toronto. “The new drugs are a treatment, not a cure”. The event’s real purpose is to help people living with AIDS whose life and existence are in danger. We need to fill them with the same hope that Fashion Cares fosters. “I will keep on sawing until we find a cure” stated a model/designer.